British Columbia has spectacular views of the Canadaian Cascades and the inlets that surround it and Burnaby, a city just east of Vancouver, undulates over hills that reach 1,200 feet high. 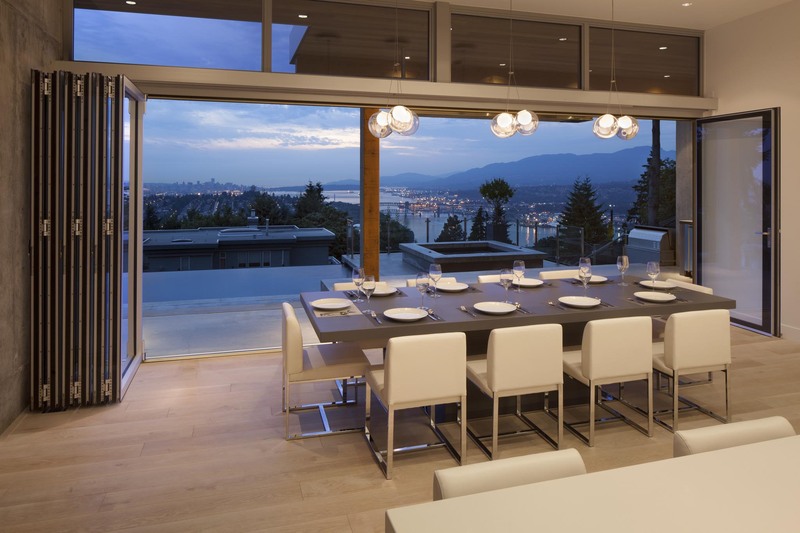 One of its residences, planted on top of one of these hills, offers big views of the Vancouver skyline and the majestic coastal ranges. For the homeowners, the Fedukes, making those views an integral part of their residence was important. So much so, they chose to blur the lines between outdoor and indoor living. 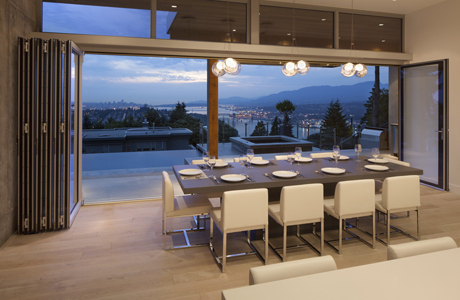 They accomplished this with a NanaWall system, which separates their dining and kitchen areas from the backyard. 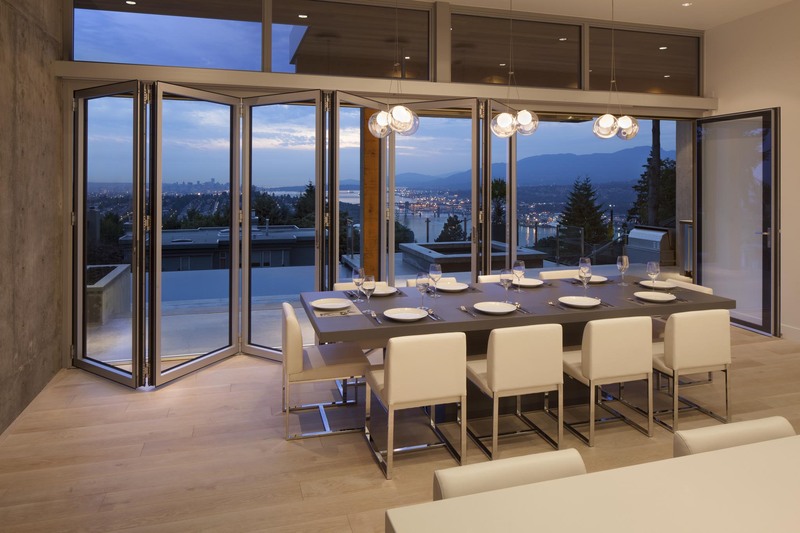 “We wanted the ability to open the interior to the outdoors and to create a large entertaining area,” Jason Feduke explains. 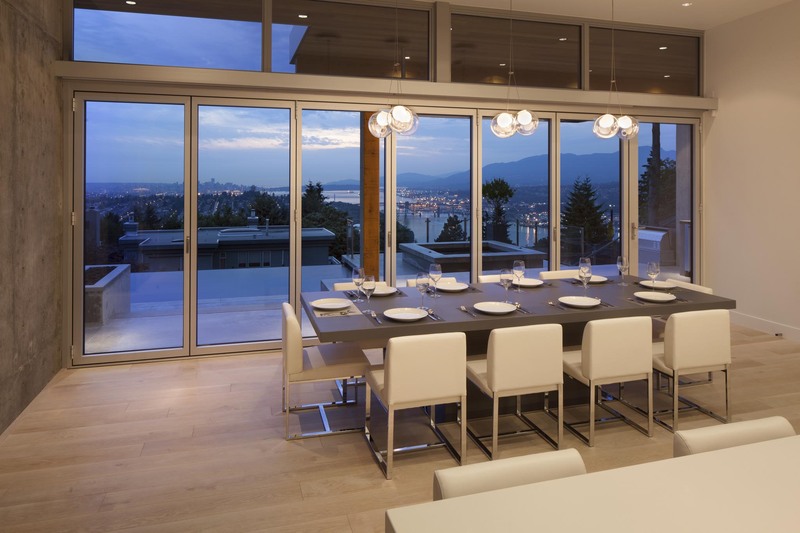 “The NanaWall SL82 gave us this, as well as unobstructed, panoramic views of Vancouver.” This effect is enhanced because the layered glass overlaps the slim aluminum profile, achieving a nearly edge-to-edge glass opening. From the outside, it stylistically appears to look just like the glass on a high end skyscraper. “When the wall is closed, the SL82 has no frames and all the glass panels are extremely attractive—it looks like seamless glass from the exterior." The NanaWall SL82 is also easy to operate because of its carefully engineered rollers with sealed ball bearing carriers and height adjustments. The Fedukes are secure because of its multi-point locking that operates with the turn of a handle, and the concealed and adjustable hinges that defend against expansion and contraction. From its onset, Burnaby has been associated with exploration. In 1859 Robert Burnaby surveyed the freshwater lake in the center of this town, and the city was named after him. While the Faduke family eats dinner, their eyes explore the Iron Workers Memorial Bridge, the Cascade Mountains or the Vancouver skyline. Whether opened or closed, the NanaWall allows for this exhilarating experience. 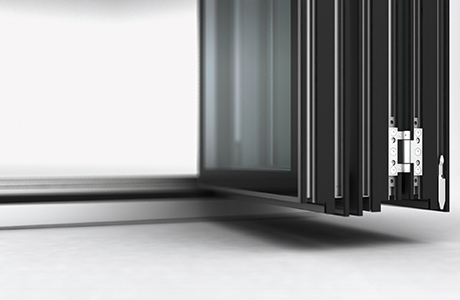 “When the wall is closed, the SL82 has no frames and all the glass panels are extremely attractive—it looks like seamless glass from the exterior, ” Feduke explains. Other elements in the house attest to its contemporary design. 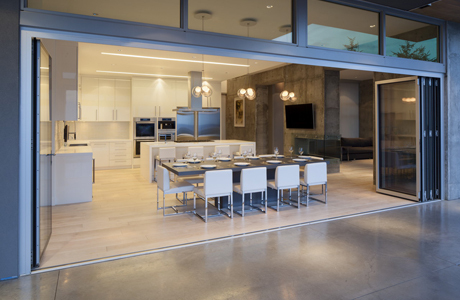 Both interior and exterior utilize concrete and wood. Ironically, the exterior concrete is polished and smooth, while its interior application is rough and unfinished. Similarly, the wood underneath the cantilevered eaves is stained, but the wood floor in the dining space is left unfinished. 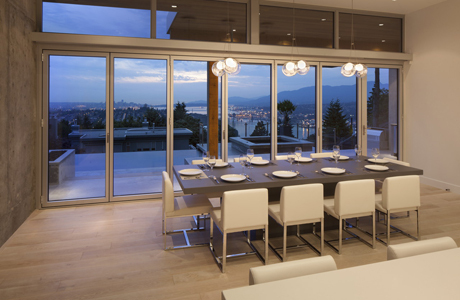 Glass in other places unifies the indoor and outdoor spaces. For example, the glass fireplace was integrated into the load-bearing wall that separates the dining and living room spaces. Panels of glass are also used to separate and protect the patio seating area. The SL82 comes in many style options, and the Fedukes fused their design with its stainless-steel look. The appliances—stove and barbeque, for instance—match this finish. Because the house faces west, the NanaWalls and the transoms above them provide needed daylight. 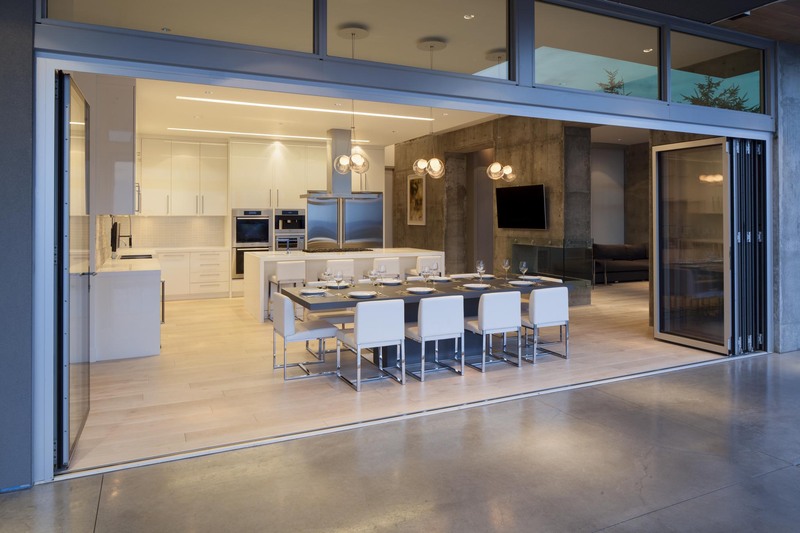 British Columbia stays fairly temperate all year, so opening the walls provides natural ventilation. Nevertheless, it is the daily vistas—the harmony of human invention and natural splendor—that make this room so transcendent. The Burnaby NanaWall house is just a small footnote in this evolving human story, but a pleasure for its owners.